When I study the Bible, it’s usually by myself. Though I seek the Holy Spirit to guide me, I seldom have the input of other people. 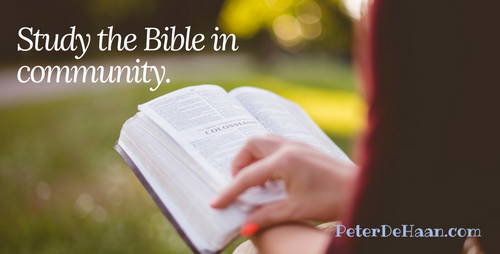 Though there’s value in personal Bible study—which everyone should pursue—greater value comes when we explore Scripture in community. A true group Bible study has no leader. Anyone can share their perspective, and no one guides the process. It is egalitarian, with everyone an equal participant. The words fairness, balance, and equality come to mind. This is far different from a typical church service where one person speaks and everyone else listens. One person’s opinion, often presented as a singular truth, becomes the perspective that the faithful must adopt. Anyone who dares to disagree risks being labeled a heretic or effectively run out of the church. We should acknowledge that there is no one right response to any given passage in the Bible. Instead there are many responses. It’s like studying a piece of art. Look at it from different angles, at different distances, and even at different times. Each experience can emerge as a new one, providing fresh insight. So, it is when we study the Bible. A quick way to get multiple perspectives comes from seeking the opinions of others in a group setting. In a group Bible study, discussion can take place. One person shares their perspective and another one responds. They may agree, disagree, or—even better—build on each other’s comments. Some people think only trained clergy can teach them about the Bible. This is in error. Through Jesus we are all priests, and through the Holy Spirit we each have a guide to direct our study of the Bible. People who think all their spiritual instruction should come from ministers, in a church setting, worry that heresy results when those outside established religious organizations take on the task of understanding the Bible. However, in the last 2,000 years, every major heresy has come from within the established church, perpetuated by trained clergy. Having a community with every member participating stands as a strong force to prevent heresy. This is because in a group setting, the people in the group can quickly squelch a heretical idea. But in a church, especially with a charismatic leader, dissension is much less likely to occur. Then, before long, the dynamic leader has the congregation metaphorically drinking the Kool-Aid. Personal Bible study is essential; group Bible study is even better. If you’re not already in one, join a Bible study.